Pontypridd Museum MuseumHoused in a converted chapel built in 1861, Pontypridd Museum tells the history of Pontypridd and its people through a variety of exhibitions. 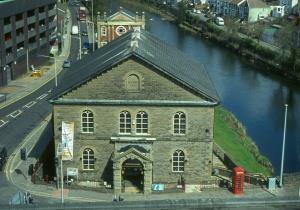 The converted Welsh Baptist Chapel situated next to Pontypridd’s iconic Edward’s Bridge (known locally as the Old Bridge) houses working models of nearby canals, mines and railways, archived film and voice records of the history of the area, historical objects and a magnificent pipe organ which is still used for recitals. Use of audio-visual programmes and ‘hands on’ exhibits illustrate elements of social, military, sporting and cultural history, as well as industry and transport.